Did you know that June is National Iced Tea Month? Well... I knew that since I am a big iced tea drinker so I am really excited about introducing you to our next company which is called Tea Forte which sells some of the most fabulous hot tea and iced tea products I have ever tried. Besides the products being fabulous...they are also affordable! When you shop the Tea Forte web site you will find teaware, iced tea, hot tea, cocktails, minteas and tea related gifts. During the month of June you can get 2 free iced tea glasses when you purchase one Brewing Pitcher Set and one Five-Over-Ice set. Just use coupon code ICED49 during the checkout process and see the web site for details. This special offer expires on June 30th, 2011 so hurry up and make your purchase today! My Review: The generous folks over at Tea Forte sent me a few products to try out for all of you. First up...I was sent their Tea Over Ice Brewing Pitcher to review for you. This is a nice elegant clear glass brewer that is used for flash chilling your tea over ice. I love that the brewer is shaped like a glass beverage pitcher so it's super easy to use and looks great sitting on your table when serving iced tea to your guests. The brewer comes in 3 parts...the pitcher (base) and then the removable smaller pitcher goes on top with a little glass lid. You fill up the bottom base pitcher with your ice cubes and while your water is boiling on the stove top you place one of the Tea Forte pitcher-sized tea bags into the smaller pitcher. Once your water has reached the boiling point you pour the water into the smaller pitcher so that your tea bag can steep for 3 to 5 minutes. Once it is done steeping, you remove the tea bag (infuser) and pour the newly made tea into the larger pitcher over the ice cubes. Within seconds...it is flash chilled and ready to be enjoyed by you and your guests. You can sweeten your tea however you desire. They also sent me their exquisite Nantucket Tea Sampler which is called Five-Over-Ice to review for you. This sampler has 5 different flavors packaged into one box so you can make 5 different pitchers of tea. This sampler includes the following flavors: Celyon Gold, Lavender Citrus, Raspberry Nectar, White Ginger Pear and Blackberry Pomegranate. The first tea we tried out was the Raspberry Nectar as we love Raspberry flavor iced teas. OH MY GOSH...we didn't need to use any sweetener in this one and it was/is absolutely delicious! The second flavor we made was the White Ginger Pear and let me tell you...I have never had pear flavored iced tea before and now after trying this flavor...I LOVE IT!!!! So far...we have made 2 pitchers of tea and we LOVE them both! I am looking forward to trying out the other 3 flavors and I am sure they are just as delicious as the first two. 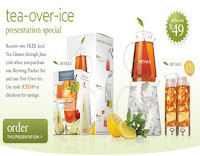 We give this iced tea brewer and tea sampler set a HUGE thumbs up!!! I would personally like to thank the generous folks over at Tea Forte for participating in this product review. Your iced teas are the BEST homemade ice teas I have ever made at home! My family loves them!